During yesterday’s Senate Intelligence Committee hearing Sen. Marco Rubio strategically and systematically dismantled former FBI director James Comey’s allegations of obstruction of justice. It was a thing of beauty. Comey, a creature of Washington, DC and an individual very well aware of the law never said to Donald Trump that the conversation might be inappropriate. Yet, he managed to take notes afterwards. That is called CYA. However, how is it if a president was supposedly telling Comey to stop an investigation with regards to Flynn, would he has said the following? With regards to President Trump supposedly trying to pressure FBI director Comey with Flynn investigation, Comey even came out and added the following when being questioned by Sen Rubio, “Yes, sir. He (Trump) actually went farther than that. He said, “And if some of my satellites did something wrong, it’d be good to find that out.” So Trump is telling Comey to find the bad apples now, sooner than later. This is obstruction, really? SEN MARCO RUBIO (R-Florida): Thank you. Director Comey, the meeting in the Oval Office where he made the request about Mike Flynn — was that the only time he asked you to hopefully let it go? 58:20 — COMEY: But in the moment, it — it didn’t — it didn’t come to my mind. What came to my mind is, be careful what you say. And so I said, “I agree Flynn is a good guy.”RUBIO: So, on the cloud — we keep talking about this cloud — you perceived the cloud to be the Russian investigation in general, correct? COMEY: … correct. Yes, sir. RUBIO: Your — the president’s wishes were known to them, certainly, by the next day, when he had a press conference with the prime minister.RUBIO: But going back, the three requests were; number one, be loyal; number two, let the Mike Flynn thing go, he’s a good guy, he’s been treated unfairly; and, number three, can you please tell the American people what these leaders in Congress already know, what you already know, what you’ve told me three times — that I’m not under — personally under investigation? 63:40 — RUBIO: You know, this investigation is full of leaks, left and right. I mean, we’ve learned more from the newspapers sometimes than we do from our open hearings, for sure. Now the question is who Trump’s VP pick might be. Would Rubio make a good VP? Hmm, Will Marco Rubio Endorse Ted Cruz and Will It Make any Difference? It is being reported that former GOP presidential candidate and Sen. Marco Rubio (R-FL) is close to endorsing current Republican presidential candidate and Texas Sen. Ted Cruz. One can never get enough endorsements but one also has to wonder whether it will make a difference. If Cruz wants to catch front-runner Donald Trump and minimize establishment candidate John Kasich, an endorsement from Rubio probably could not hurt. Except for his position on illegal immigration, Marco Rubio is a pretty strong conservative. A Rubio endorsement might have meant a little more had Marco gotten out of the race before the Florida primary where he got soundly defeated by Trump We shall see what happens. In the end conservatives do need to stick together. Marco Rubio is close to endorsing Ted Cruz, but the two proud senators — and recent fierce rivals — have some details to work out first. Cruz has to ask for the Rubio’s endorsement, and both sides need to decide that it will make a difference, according to sources familiar with the thinking of both senators. Rubio and Cruz, who are more friendly with each other in the Senate than they are with longer-serving colleagues, occasionally chatted and patched up their sometime-rocky relationship on the campaign trail heading into Florida’s primary Tuesday, when Rubio was blown out by Donald Trump and subsequently quit the presidential race. Rubio, who returned to work Thursday in the Capitol, told reporters “I don’t have any announcement on that today” when asked about a Cruz endorsement. Rubio indicated, though, that he might have something to say soon. “There’s time to prevent a Trump nomination, which I think would fracture the party and be damaging to the conservative movement,” Rubio said, stressing that he’s not interested in being anyone’s vice-presidential pick or running for Florida governor. Sen. Marco Rubio (R-FL) announced he is suspending his 2016 presidential campaign on Tuesday night after he lost his home state Florida primary badly. With 98% of the precincts reporting, Trump beat Rubio 45.8% to 27% and gained all of the 99 delegates in the winner take all primary. Earlier in the day Rubio claimed that he would stay in the race if he lost Florida. Everyone with a clue, including Rubio, knew that was never going to happen. The overwhelming Trump victory was a political death blow to Rubio and thus Marco ends his bid for the GOP nomination. 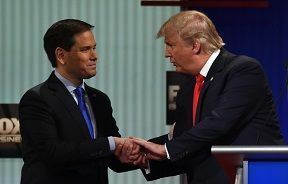 The political pundits will say that Rubio lost because he ran a terrible campaign, because of his robotic answers during the debate where he repeated himself 5 times and they will say its because he went out of character and attacked Trump personally with the small hands comment. They of course would be wrong as usual. Marco Rubio lost and lost badly because he lied to the American voters when he was elected to the US Senate for his stance on anti-illegal immigration and then became part of the Gang of 8 attempting to allow amnesty to illegals. What he was thing we may never know but it was the kiss of death for his political career in the Republican party. Being labeled the “establishment’s” boy also did not help Marco in an election cycle where the outsiders have dominated the race. Marco Rubio announced he is suspending his 2016 presidential campaign on Tuesday night after a projected loss in the Florida primary. Despite pre-primary polls that showed him trailing Donald Trump in the state, which he represents in the U.S. Senate, Rubio predicted he would “shock the country” and win Florida’s 99 delegates. That did not happen. ABC News projected Trump will win Florida’s GOP primary, based on analysis of the vote. “After tonight, it is clear that while we are on the right side, this year, we will not be on the winning side,” Rubio told supporters in Miami. In the final days of his campaign, Rubio emerged as one of Trump’s staunchest critics, attacking the GOP frontrunner’s rhetoric and record while mocking his tan and the size of his hands. “The Republican Party is not going to allow itself to be hijacked by fake conservatives and people who go around dividing us against each other,” he said at a campaign stop in the Sunshine State on Monday. And he echoed some of those points in his speech tonight. Honestly, I have no idea where Rubio goes from here. He should have gotten out before tonight’s terrible loss. Rejected by nearly a 2 to 1 margin in your own home state. How does he even run for governor?